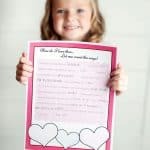 These Printable Valentine’s for Grandparents are the perfect way to make your Grandparents feel loved on Valentine’s Day! Our Grandparents don’t live close, but we still like to wish them a Happy Valentine’s Day. I try to find things to send that are fun and meaningful. 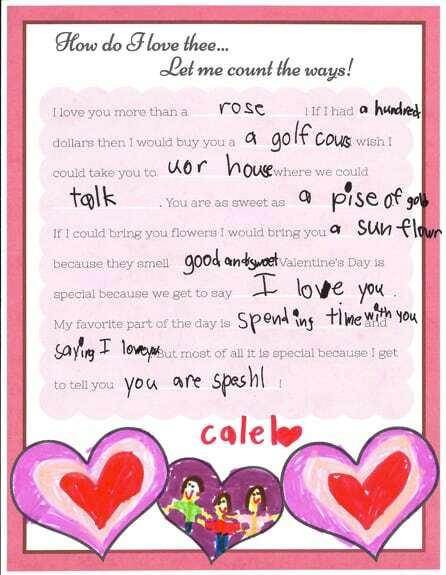 This year I made a Valentine’s Mad Lib for Grandparents and Valentine’s Hand and Foot Printable for my kids to fill out for them. You can see how we filled them out below and download your own copy at the bottom of this post! I added the hearts on the bottom for them to draw some pictures or color in for their Grandparents. For younger kids that can’t fill out the mad lib, I made a cute little printable with saying that you can stamp their little hands and feet on. I think it turned out pretty cute!! I printed them all out on white cardstock and for family night we had a blast filling them out! I think they turned out so cute — I love all the mis-spellings! I know that the kids grandparents will treasure these forever! Download the printables by clicking on the link below! It is a ZIP file that has both printables in PDF and JPG format. You will need to unzip the file to get the PDF’s and JPG’s. If you love these printables, I’d love it if you’d be willing to pin the image below!! Thanks so much! Most deserving person for our love on valentines day. Great post. have the links been corrected yet?? – these are awesome and fill me with ideas for the grandparents that live away. Yes! I’m sorry I did not even realize they were bad. They should be all fixed for you though! I cannot seem to get the pdf files to open up. I want to use these this September for Grandparents Day!! We are using this for both sets of Grandparents! Thank you for sharing!! using these for valentines day this year for the grandparents. thanks so much! what a cleverly cute idea! thanks for creating it and making available. This is so cute!! I think I’ll let me boys do this for each set of their grandparents…don’t want to leave them out! Thanks for sharing. Stopping by from Skip to My Lou’s linky party! 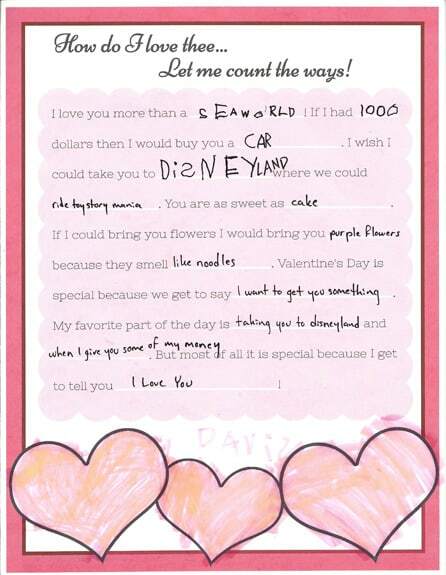 Love the Vday Mad Libs letter! I know what the grandparents will be getting! Perfect for practicing handwriting, too! Glad I saw our linky at No Time for Flashcards! For a first time finger painting/hand print/foot print… what is the best pain or method to go about? At this point my stash consists of regular watercolor paint and do a dot markers. This.is.AWESOME !! Thank you, it is perfect for our out of state grandparents! I would love to Pin It but my “Pin It” button isn’t working on this, though. I Loved doing these with the kids. We made several for family members. It will be price to look back on these in a few years 🙂 I am just starting a blog (2 days ago..lol) I was wondering if I could link this to my post? Not sure yet how it all works, but I want to upload the kids and want to be sure to give the credit 🙂 Thanks again for this printable! I Love it! Thanks for much for the printables! They are AWESOME! Love this! Thanks for sharing – this is what we are sending to Grandma and Grandpa this year!